Surfrider hosts a monthly beach cleanup, typically on the 4th Saturday of each month. Most of the items collected at beach cleanups are plastic and don’t truly biodegrade. It is important to host cleanups because litter is ugly and we want to help protect the coastal wildlife that we love! Volunteers under 18 MUST have a parent or guardian present at the beginning of the cleanup to sign a liability waiver before the minor can participate. You can download the waiver here: 2016.Beach.Cleanup.Waiver. We will provide all supplies, but volunteers are always welcome to bring their own work gloves, trash bag/bucket, and/or reusable water bottle to reduce waste. Please be prepared to fill out a data card of all the trash you pick up—we need this information to help find solutions for the main sources of trash on our beaches!! Check out what we found last year: Surfrider_VC_Chapter_2015_Beach_Cleanup_Report. Thank you for your interest in helping keep our beaches clean. 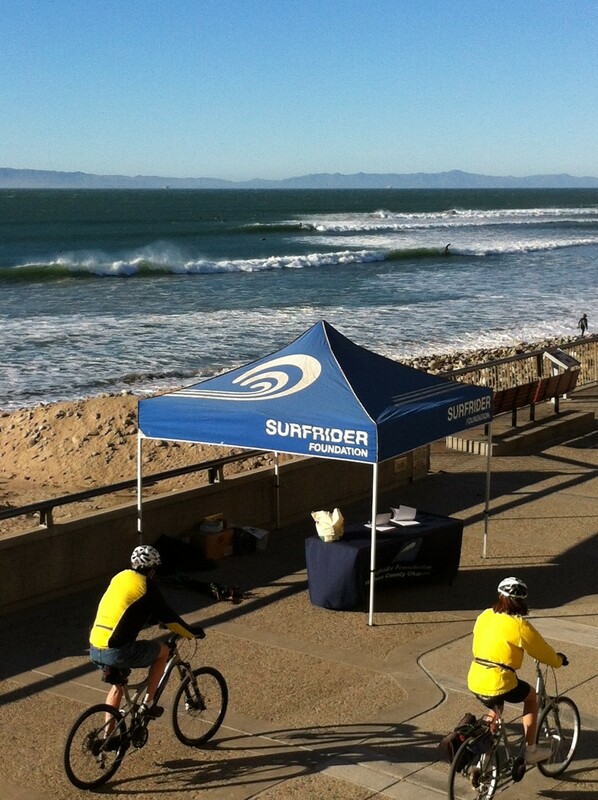 Look for the Surfrider tent when you arrive at a beach cleanup to check in! Directions: Hwy 101 south and exit on Rice, turn right and continue to Hueneme Rd. Turn right on Hueneme Rd. After Olds Rd. take a left on Arnold and continue to the end of the road. Where to park at C St – The Surfrider tent and check in is located at where C Street meets the Promenade. The most convenient parking is at the multi-level parking structure but they charge and we don’t validate. There are a couple of free parking options within a short walk, check out the map below. The free parking on Paseo De Playa often fills up quickly but the free parking off Front St typically has space then you can take the walking bridge over the freeway to the promenade.